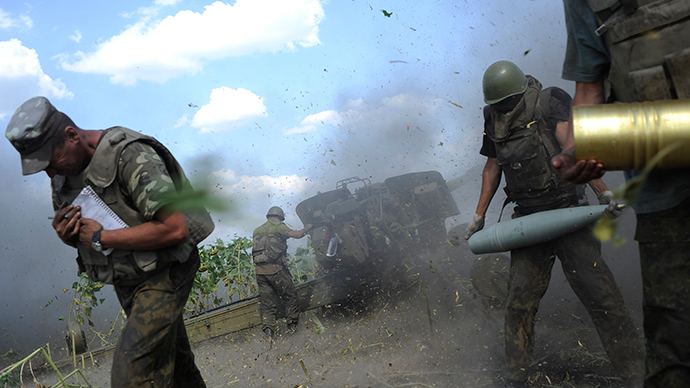 Kiev Junta Firing Ballistic Missiles at Own People. Kiev Junta Firing Ballistic Missiles at Own People. White Phosphorous Bombs. War Crimes. Poor Villagers Massacred. Huge Collections of Photos. Horrific Scenes of War all over east Ukraine. Humanitarian Catastrophe: Lugansk without water, power,phone,Internet. Bodies Blown to Pieces, Streets Red with Blood. Graphic Scenes of Mass Murder and Mayhem. Obama Sends Planes Full of New Weapons to Ensure Carnage Continues. American Media Not Showing What You are About to See Here. The eastern Ukrainian city of Lugansk has declared a state of humanitarian catastrophe over a lack of medical supplies, electricity, lighting, mobile and internet communication. Some 250,000 civilians are unable to leave, the statement also says. “As of August 5, Lugansk remains disconnected from electricity. The situation remains critical on the city’s territory. Lugansk is has no energy, is in a state of humanitarian catastrophe. Since Sunday, part of the population in the region’s center have been without light or water, as well as mobile and internet communication,” the statement on the city council website read. Due to high temperatures and the damage to most community services’ cars, rubbish collection “completely stopped,” which is why the city is basically “on the brink of an ecological catastrophe,” the administration said. “Today 250,000 civilian Lugansk residents – mainly retirees and families with children who don’t have the money to leave the city and who have nowhere to go – have been the hostages to the situation: the people are forced to live in the conditions of armed clashes, with the lacking communications, the remaining nutrition disappearing from the counter of shops and supermarkets which are still working,” according to the statement. An especially burning issue has become the lack of medical supplies. “People can’t purchase the essential medical supplies, only a handful of drugstores are operating,” the statement added. “Many people have left the town – I had almost no one left, only my sister. If you had gone out to your balcony in the evening, there would be a feeling that the city had died out,” a former resident of Lugansk, Olga, who recently moved to more peaceful Kharkov, told RIA Novosti. Transport communication is no good in the embattled city these days, Olga said. The shops work several hours a day, and Olga said the prices have increased, there are almost no cigarettes on sale, but it’s still possible to buy food. In the evenings, people try not to go out. Attacks and clashes are an every-day occurrence. Another resident Olga, who spoke to RT, said that the situation has recently changed: for the worse. “The fighting used to be away from residential areas. But now the locals, the children are suffering, they’re scared,” she told RT’s Maria Finoshina. Many of the residents who stayed in the city are forced to shelter in the basements. There is a shelter in almost every household: it looks like an apartment, but underground. Even the youngest ones share the adults’ fears, as 13-year-old Artyom said. While RT’s Marina Finoshina was speaking with the locals, the electricity went dead. “Sometimes the wires get ruptured. When it’s in neutral zone, some workers go there to fix the connection. They carry a white flag, but they just get fired on,” local resident Irina explained. The Ukrainian army has approached the outskirts of Donetsk and Lugansk, preparing to storm these cities, the speaker for the Council of National Security and Defense, Andrey Lysenko, declared, as quoted by Ria Novosti. “The main forces of the anti-terrorist operation, including the territorial battalions have approached those areas. It doesn’t mean that the storming has already started, but preparation to free the cities is on,” he said. The attack won’t be announced, only the seizing of the cities, Lysenko added.